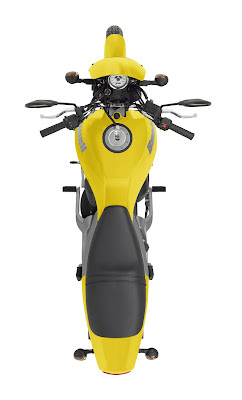 What you see above is the new 2010 model of BUELL Blast. Yes, it is dead. This is an Obituary to a bike we all dearly loved. Blast, the small petite thumper from BUELL is no more. News of its death has been splashed all across the web and daily as I check The Knee Slider, the news of its untimely departure was really sad. 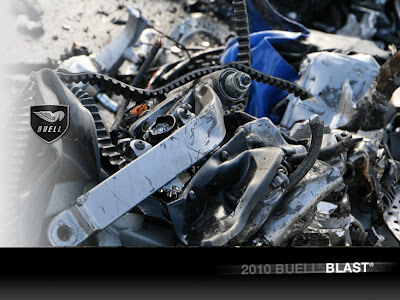 Hurridly on checking the official BUELL Blast website, saw this. So the confirmation came that the news is true. Just read what they wrote on the obituary. Horsepower / Torque 0 HP / 0 ft. lbs. The Buell® Blast was a cute little motorcycle. It just never made much of a sportbike. But, as luck would have it, it makes a killer ottoman. Or end table. Or art piece. Through an innovative process known as crushing, we’ve turned a limited number of Blasts into colorful metal cubes, each numbered and signed by Erik Buell himself. Hey, there’s no denying the Blast’s aforementioned cuteness. But there’s nothing cute about racing or riding a sportbike the way it was meant to be ridden. The 'Thumper' for beginners is not actually for beginners alone. Anyone would literally have a 'Blast' on the motorcycle. It's cool looking, very distinctive of the Buell styling, an easy handler and it is/ was affordable. While experienced riders would have lots of fun on it, it would instill confidence in new riders. It has a good performance machine for an engine of its size and it is of course very refined. And even for youngsters, it was the better sensible machine as it was easy on the pocket with minimum maintenance and quite frugal at 25kmpl (70mpg). This 492cc air-cooled, four-stroke, single-cylinder is equipped with 34 horses. The better thing about this thumper is the wide range of powerband which suits city riders and powerband just shoots north in the highway. All in all, this is/ wasa very able bike suited to all kind of riders. Just because it's small, Buell didn't take it as a starter bike. In fact, it has so many features found in it's bigger siblings, there were no step motherly treatment. Knowing what kind of crowd it would draw, Buell has given the Blast some very good features. The muffler is not by the side of the engine, rather it is placed below the engine and this keeps the exhaust away from the rider's body. It weighs only 164 kgs (360 pounds) dry. The standard Blast seat height is 27.5 inches. but to suit riders with lesser height, the rider has the option of fitting a factory made low-profile seat that reduces seat height to 25.5 inches, so just about any rider can reach the ground. 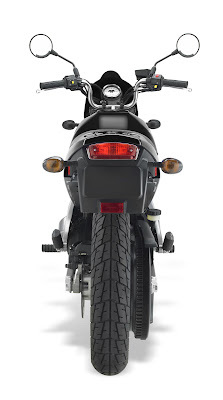 The Showa gas-charged rear shock and forks offer a very comfortable ride. It has Kevlar reinforced drive belt with self-adjusting hydraulic valve lifters. The drive belt doesn't need lubrication or adjustment adding to the ease of the rider. The 10 litre tank is small for long touring but best suited for any other purpose and of course this bike is not meant for long tours, nonetheless, it will happily see you go 250 kilometers with a full tank. A high quality instrument panel displaying Electronic speedometer with LED, odometer and tripmeter; built-in LED, indicator lamps for low oil pressure, high beam, turn signals, neutral. Even minor features are taken care of like the shift pedal which are fully adjustable that enables personalized fit and has flexible turn signals to resist damage and there is a good amount of underseat storage space. The Blast is built to be durable, with tough Surlyn composite body panels. The color is molded into the Surlyn, so light scratches can be buffed out. With all these features and the wide range of riders the Blast caters too, why would Buell stop producing this lovely gem? Of course not, it won't stop production, well I dont have any proof of it, but we can all guess, that a 2010 Blast is gonna be all new. We dont know when, but sure, it is coming. The other hint is that you must have heard about the new UK bike firm MAC Motorcycles and these guys have the Blast engine in their motorcycles. 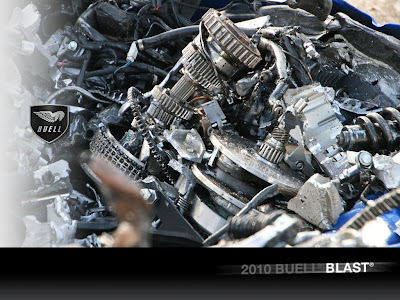 Where do you think they will source the engines from if Buell stops production of the Blast? Surely they wont stop now, I mean MAC Motorcycles have just opened shop, right, so guess... we are going to see a all new Blast. Man, it's gonna be a BLAST! Wheels Front & Rear - 5-spoke cast 2.5 in. x 16 in. & 5-spoke cast 2.8 in. x 16 in.